Hi girls! 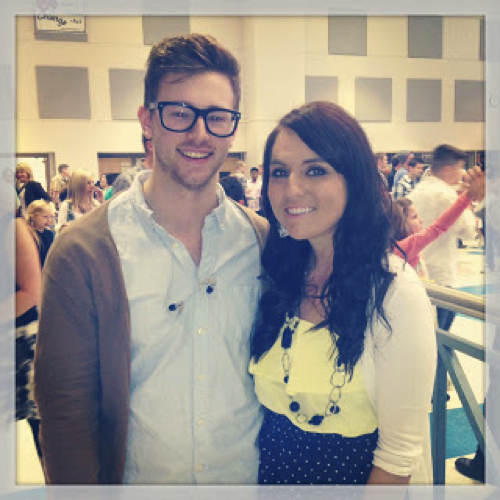 I am so excited to be guest posting for Jamie while she is on her HONEYMOON!!! I am sure she's soaking in the sun, the beautiful ocean with a cocktail in her hand, and precious time with her new hubby! My name is Brittany and I blog over at Happy Is A Choice. 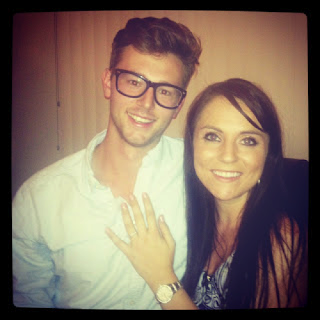 I am in my mid-twenties, and recently I also got engaged to the man of my DREAMS! You can read our proposal story here. We met at church last year, he swept me off my feet, and 8 months later, he got down on one knee and asked me to be his wife. I am so excited! Some other exciting things going on in our life: we JUST bought a house. We closed on it yesterday, and today we get keys. Funny story about Jamie-she tweeted awhile ago how she was trying to get her soon-to-be hubby's house ready for her to live in it, and it was right around the time Ronnie and I were deciding who would live in our new house until we got married. Well-after Jamie's tweet, I was more sure about our decision for ME to live there. So I will be living in our new house for a few months and then on October 5, 2013, he will join me for sleepovers EVERY NIGHT! Last week I went to Iowa for my dear friend Sarah's wedding. We went to a Mexican bar/restaurant for her bachelorette party and we came across two little old ladies, sipping away on their margaritas that were bigger than they were! We chatted with them for a minute, and they offered us two pieces of marriage advice that really stuck with me, and I wanted to share these. Simple, right? Forgiveness sounds easy, it sounds like a good idea but when someone hurts you, and they will because we are all human, it just plain stinks. Sometimes, I just want to be mad. I want to hold that wrong above people's head as a way to get my way. Sometimes, you just hurt so bad, you don't know how to forgive. But as believers and followers of Christ, we are called to forgive. We need to forgive when it hurts. By God's grace, we were forgiven for our sin. We have been offered the free gift of grace, which we need to extend to our boyfriends, fiancés, and husbands. This isn't always easy, but this is one of the best ways for you to display the love and forgiveness of Christ to the man in your life. Holding a grudge, secretly harboring bitterness against someone, and constantly bringing up old hurts is going to be a path for destruction in your marriage. Forgive like Christ forgave you, and He will bless you and your marriage. Girls, whatever you think is the greener grass, I am here to tell you that it will bring its own problems and stresses in your life. Nicole from Bloom said it great when she said in her guest post that life isn't PERFECT once you get that ring, once you get married, once you have that house. This is most important for married people, or us about to be married girls. The divorce statistics break my heart. God designed marriage as a life long covenant with our spouse. His heart breaks over couples who give up on their marriage and divorce. I look at the couples I know, the marriages I have seen end, and wonder how many of those ended because someone thought the grass was greener on the other side. How many people leave their spouse for someone new, how many husbands or wives long to be single and carefree again and think thats where their happiness lies? I urge you to be careful and cautious of this truth. When you get trapped in that comparison trap, when you get fixed on something new and shiny that isn't what God has for you, ask God to search your heart. Ask him for contentment with the blessings he's provided you with. God wants us to honor marriage, and our husbands and future husbands. Put your hope in Christ alone because our men will let us down from time to time. It won't be perfect, but marriage isn't primarily for our happiness. Did you know that God designed marriage as a way for both partners to become more and more like Christ? Love takes work. Being selfless and laying down ones desires and expectations to serve a husband or wife isn't natural. Day by day, minute by minute we have to chose to love and serve our spouse well. Marriage is a beautiful picture of Christ's love for the church, and Jesus provides an example of how we should behave in marriage. If you're married or engaged, I urge you to be praying over your man and your relationship daily. I urge you to pray for protection, for wisdom, for grace, and for obedience. If you're single, I want you to know God has your love life already written. He has it under control. He has the best in store for you, I promise. It took me 24 years to find my prince and he was worth the wait. Thanks for letting me take over your blog today Jamie. I am absolutely ecstatic for you and your new hubby. Enjoy your honeymoon pretty! I love this!!! For a girl who feels like it's constantly a struggle to not wish I was in the next 'perfect' season, this is such a wake up call. Thanks for sharing sweet lady!